We have all heard it said, Content is king. But what is content? Content is the text, hyperlinks, images, videos, (everything) on the screen. All content must work together, combining pieces of the puzzle to make one amazing picture. If we agree that content is a key driver of traffic to your site, then we agree that good content is compelling. But what makes content good? Good content is magnetic, complete with imagery and writing any high school graduate can understand. 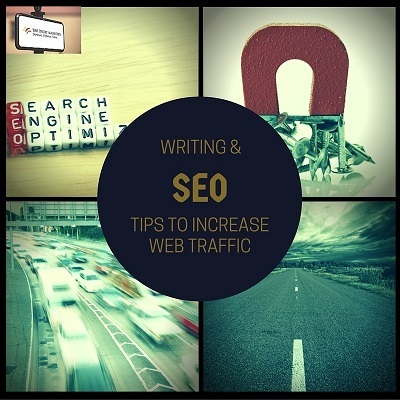 Achieve this with your writing to increase website traffic. Maintain a consistent style and form. Adopt a style guide. Will you choose Oxford comma? Will you spell out dates or abbreviate? Maintaining uniformity on each page will make it easier for your readers to follow your posts. Use a thesaurus. Use synonyms to allow search engines more opportunities to group your content with similar ideas and bring more organic traffic. Incorporate a keyword search tool: Google Adwords, SEO Tools, or any several free sites. Everyone is busy; direct and entertaining content will keep your visitors engaged. Domain-Level Link Features: links to your site from other credible sites. Page-Level Link Features: relevant linking out to trusted sites to substantiate your remarks. Page-Level Keyword & Content-Based Features: using keyword terms in certain parts of the HTML, i.e., title and header tags, image file names (and alt attributes). Page-Level Keyword-Agnostic Features: length of page, load speed/server response time. Domain-Level Brand Metrics: the amount of mentions of the domain name in the Fresh Web Explorer. Domain-Level Keyword Usage: using a high-value keyword as the domain name. Domain-Level Keyword-Agnostic Features: length of the domain name. Shorter domain names are better. Page-Level Social Metrics: number of social shares a page accumulates. Links to the sub domain come from an unusually small number of pages. Create a content calendar. Publish new content at least weekly, if daily is too much to keep up. Designate a brand ambassador to author articles or blog posts on sites with large audiences, create back links to your site. Web content standards have evolved making how you write is as important as what you write. Make your site a resource for your audience: provide information, make it funny, use images, and video, where possible. What about you? Do you have a surefire trick to bring more views to your content? Share what works for you in the comment section below. Great points, SEO and content really need to work together as a team. Also: that gif made me LOL! Thanks for your comment and Welcome! I saw that gif and couldn’t resist. Nievalyn Keel is the techymarketer. A communications enthusiast with a great affinity for technology. Having spent the last 12 plus years working in various facets of communications from book publishing, to new (digital) media, to professional services marketing.